I’ve been using mind maps more often lately, to plan feature stories, as well as for household maintenance and hobby projects. While pen and paper work great, software tools are more flexible and can accommodate detailed information better. I tested a bunch of web apps like Mindmeister and Bubbl over the past few weeks, and I liked a couple of them enough. But I’m especially digging WriteMapper, which is available for Windows, macOS, and iPad. 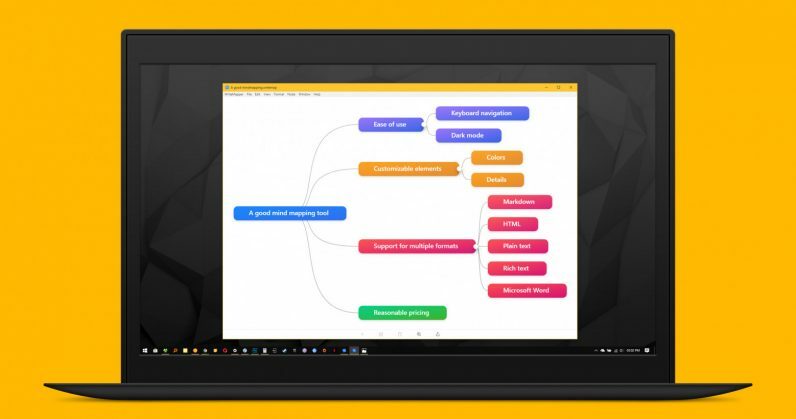 The desktop app is great for creating simple or complex mind maps. It’s a breeze to navigate through nodes without ever touching your mouse – you can just use your keyboard to move between them to make changes or add details. Plus, it’s easy enough to learn the ins and outs of the sparse interface, so you don’t ever need buttons taking up room on your maps. Above is a sample mind map I put together (sorry, you can’t see all my top-secret plans for podcasts and woodworking just yet). You can color-code nodes, re-order them on the map (they fall in line automatically when you drag and drop them), and collapse nodes when you don’t need to see the entire map. Plus, you can add detailed notes, complete with formatted text, links, and images. And yes, there’s a dark mode. With its recent update, you can import Markdown and HTML files to automatically generate mind maps from them, and also set custom keyboard shortcuts for just about every function in the app. That’s pretty much all I need from a tool I use a few times a month. I wish it offered an option to export maps as images, and a web app so I could access my maps on other devices – those are problems you won’t face with its browser-based rivals. But given my frequency of use, I’m happier paying a one-time fee than subscribing to a monthly plan for mind mapping. Other apps like Mindmeister offer many more features, including map history, support for file attachments, team collaboration, and storage for your files – but for all that, you’re looking at a recurring cost of $5 a month. If you don’t care for collaboration, this is a good choice. You can snap up a WriteMapper 2 desktop license for $60; the iPad app costs $20. The developer is running a sale for the next couple of days so you can take advantage of discounted pricing on single or multiple desktop licenses. If you’re on the fence, give the free week-long trial a go.